Although Himalayan blackberry (now called Armenian blackberry) is one of the most delicious fruits around, it is also one of the most destructive invaders in the Pacific Northwest. First appearing in Oregon in 1922, this prickly shrub aggressively ousts native plants, especially in riparian environments. Control of infestations has taken a significant toll on road, park and agricultural maintenance budgets. The berry reproduces through arching canes and seed. It ripens in late summer-early fall, turning to a deep purple blue. Not only do humans enjoy their lovely sweet-tart taste, but birds love them too – unwittingly helping the plant’s invasion by spreading the seed after feeding. Mix the blackberries, ground tapioca, 1/2 cup of the apple juice, the orange rind, mint, and cardamom together in a large bowl. Transfer the mixture to a 14 x 9 x 2-inch oiled baking dish. Sprinkle the fruit mixture with 3 tablespoons of the flour and dot with the apricot kernel oil. In a medium-size bowl, mix together the remaining flour, the cream of tartar, baking soda, cinnamon, spicebush berries, nutmeg, and salt. Mix in the corn oil, and then stir in the remaining 1 tablespoon apple juice and enough soy milk to make a dough that’s neither sticky nor crumbly. Using a rolling pin covered with a floured sleeve and working on a floured pastry sheet, roll the dough out 1/4 inch thick in the shape of your baking dish. Transfer the rolled out pastry onto the berry layer, cut slits for steam to escape, and sprinkle on more cinnamon for color, if desired. Bake the cobbler until bubbly, about 40 minutes. Serve hot or cold. Serves 6 to 8. 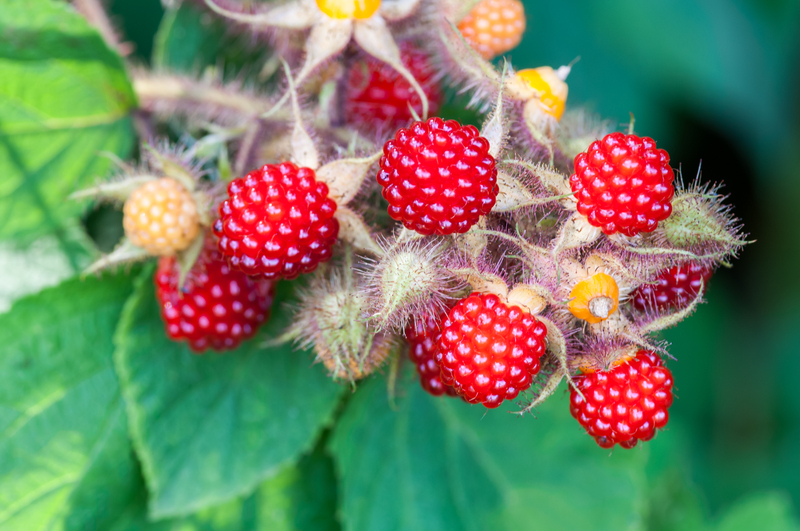 Here is a Special Bonus Recipe, featuring the wineberry, Rubus phoenicolasius, a highly invasive fruit which is abundant in the Eastern United States. In a mixing bowl, whip the egg yolks and sugar until thick. Add the hot milk, stir. Transfer to a saucepan. Heat the yolk mixture over medium heat while stirring until thick, do not boil. 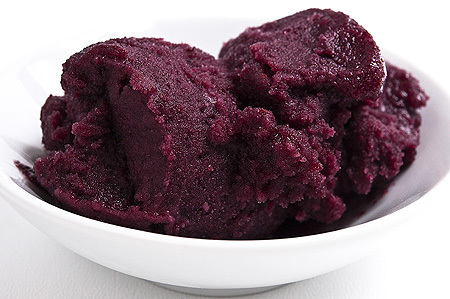 Strain the custard through a mesh strainer into a large bowl and stir in the wineberry purée. Sprinkle the gelatin over the 2 tsp cold water in a small bowl and allow it to get mushy. Melt the gelatin in the microwave for 10 seconds on half power, or place the small bowl in a pot of boiling water until the gelatin has melted. Allow the now-liquid gelatin to cool slightly, then stir it into the custard and raspberry mixture. 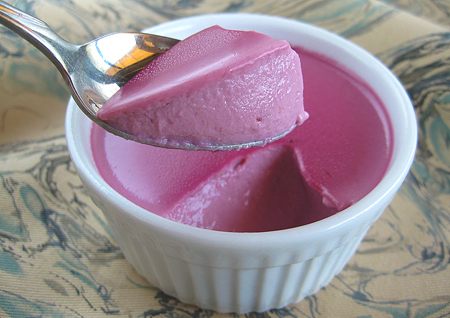 Place the bowl of raspberry custard in the fridge, and stir it often for about 1 1/2 hours. It will thicken slightly and look like melted ice cream. Whip the heavy cream until stiff peaks form. With a large whisk, fold in 1/3 of the heavy cream into the custard. Then fold in the remaining whipped cream, and whisk gently until there are no more white streaks. Pour this into the cake or cookie lined springform pan. Refrigerate for 2 hours. To make the topping, sprinkle the gelatin over the 1/3 cup water in a bowl and let it get mushy. Melt the gelatin in the microwave for 15 seconds on half power, or place the bowl in a pot of hot water until the gelatin has melted. Stir the melted gelatin into the wineberry purée and add the Chambord. Pour this evenly over the top of the bavarian. Chill another 2 hours or overnight before unmolding from the springform pan and slicing. 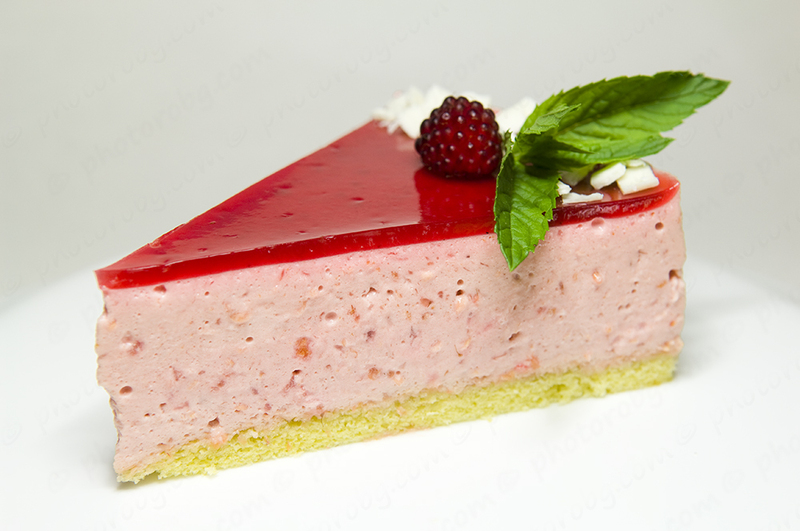 Angler, hunter, gardener and award winning author and chef Hank Shaw offers divine blackberry dessert recipes on his site Honest-Food.net – Thank you Hank! Infused blackberries make this dish heavenly! To make the dumplings: In a large bowl, mix together the flours, ground flaxseeds, cream of tartar, baking soda, mint, ginger, and salt. In a medium-size bowl, mix together the soy milk, corn oil, vegetable glycerin, and vanilla. Mix the wet ingredients into the dry ingredients. Stir in the brown rice and lecithin. Shape the dough into about 32 balls, 1 inch in diameter. To make the sauce: Mix together all the sauce ingredients except the blackberries in a large saucepan and bring the pot to a boil over medium heat, stirring often. Add the dumplings, reduce the heat to low, and simmer, covered, for 15 minutes. Add the blackberries and simmer, covered, for another 5 minutes. 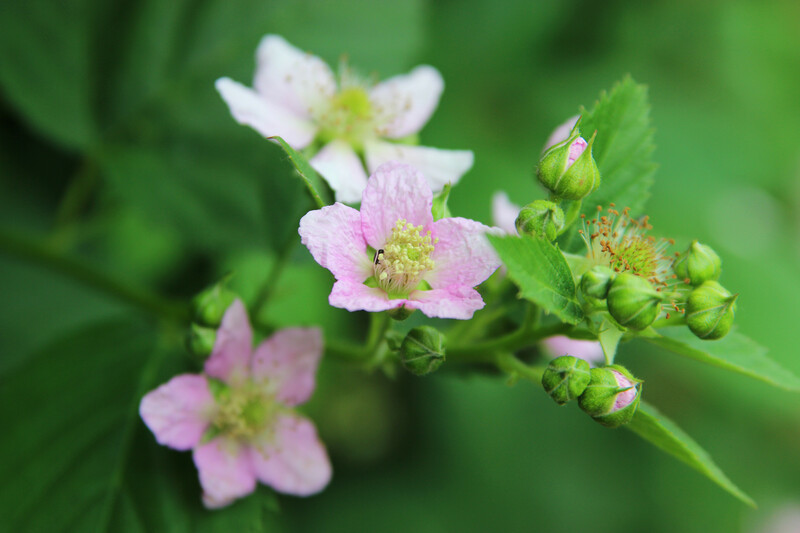 A special thank you to author and ecologist Corinne Duncan for her content contributions to the Himalayan Blackberry Introduction.